Sometimes when I start doodling randomly an idea like this pops into my head, and I can’t help but share it. I’m sorry. I already have a couple more ideas for useless philosophy thought experiment comics that I will undoubtedly be subjecting you all to soon. For any readers not acquainted with Nagel’s famous thought experiment referenced in the comic, there’s a good explanation here. 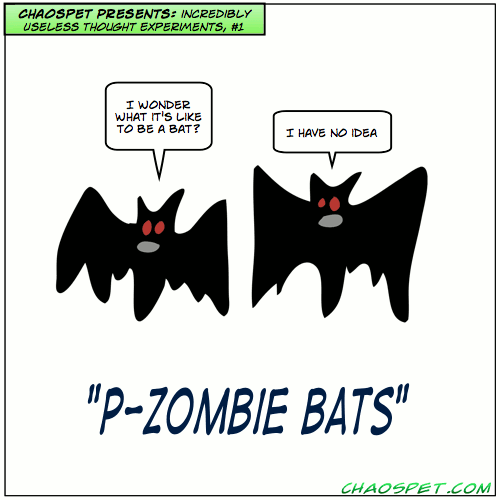 And of course, for a primer on p-zombies, you can start here. When you live in a cave filled with your own poop, sometimes it’s better to not be self-aware. Looking forward to the Martian robot swamp bat iteration and its intrinsically indiscernable Twin Mars counterpart. Oh man, you just stole my idea for the next one!